Is funny that the time when I’ve seen the most beautiful creature of my life is also when I have lost a bit more of the hope that the world can be better, the time that I’ve felt more ashamed of being a human being. At six in the morning there was like thirty people already waiting to enter the water, plus at least thirty more ex fishermans just sitting waiting to fish tourists. Here is the clearest example I’ve seen of what it means the degradation of the local cultures because of the mass tourism. Yesterday night when I arrived here I just talked with drunk guys, the same that this morning where paddling the boats towards the whale shark. Is a big contradiction, I don’t know if before they used to fish them or not. In Indonesia, the small village of La Malera, they do, since hundreds of years, but they just fished what they needed and they lived exclusively of those five or six whales they fished every year, they used the meat, the skin, the fat everything. This local communities, even if hunters have lived in harmony with the environment for years, as long as the white man didnt put his dirty hands on it, it was ok. Here they discovered the bussiness just a couple of years ago. THere was a community of whale sharks that started to get closer to the shore, the local fishermens saw them and started to feed them, until one had the great idea. Lets bring the white people to pay to see the big fish. Nowadays around three hundred people come to this little village everyday to see the whale shark. I dont know how much did they use to earn before, but now the coperative of around 150 fishermens gets the sixty per cent of the total benefits, wich makes around four euro per day, so they don’t even get rich and for what it seems all the extra income goes directly to alcohol. Early in the morning the ex fishermens goes out with the canoes to look for the whale sharks, when they find them, they start feeding them and they bring them to the viewing area, where around five to seven boats full of people take turns every half hour to see the animal. I tried to wait until the moment where the boats of the first turn came back, but it didnt matter, more and more tourists where coming. 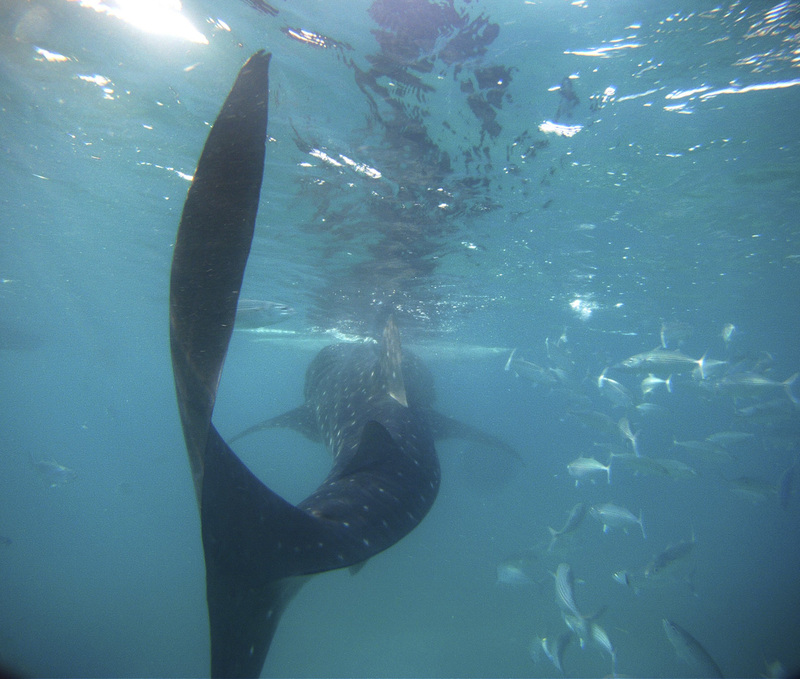 I was lucky because our boat was the first one to join the third whale shark to join the party so for some time we could see her alone, but after a while a bunch of boats were paddling towards us. Then I jumped into the water and it was like a dream to swim with that animal, but then when I came to the surface I was about to crash my head with one of the boats, then I shoked with people here and there. At least they could have been in silence, respect the magnificient of this animal, but they were laughing and screaming, it was like the apocalipse, the triumph of our human kind over the nature, it was really a degrading show. 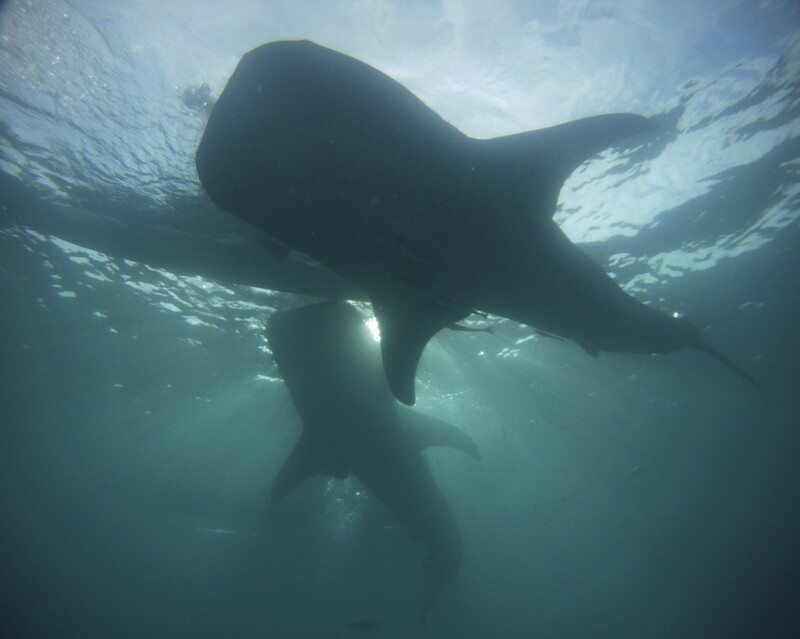 I wish the whale shark would have started eating them one by one, but there it was the contradiction, I was part of it, I was making it happen with my money, and it was sad. Probably it would have been better to go somewhere where you can see them in the wild, it would have been more dificult but for sure worth it. Right now I really want to see them again, I just want to go back to the water and maybe spread this message and help to build some concern about this animals. I’ve always tried to keep the hope on the human being and at the same time I have hated us for what we are, but without being a convinced environmentalist. Here in the Philippines, after seeing this and after living on my own skin what climate change means through the consequences of the typhoon and this twenty days of rain and floods I feel that is worth it to fight. Climate change is not really the appropiate term to talk about the planet destruction, is not something that experts and politicians discuss in summits and closed door meetings, is a fact and we see it in our daily lifes and is a matter of time until more natural disasters come and the planet says here I am and we all get scared and then realize that maybe we have a problem. THe Philippines is maybe one of the clearest examples in the world of how we are destroying the planet and is not something that will come, is already happening. Thousands of deads and displaced people that lost everything just by a whisper of the nature that gave us back what we deserved. It is really a matter of survival, and maybe not just for us, but for those who come before to have the chance to enjoy this life and live on a decent place. We wont restore the planet completely, probably is too late, but at least is worth trying and not to surrender. It is in our hands to fight for this and to be an example for the next generation. What it comes to me, I am on the fight. This entry was posted in blog and tagged agape, ALmeria, bangkok, canon 5d, carlos quiles, cebu, cinematography, filmmaking, fotografia, gh2, oslob, philippines, whale shark by admin. Bookmark the permalink.